If the joy of sharing with loved ones isn’t an option, do not fret, stress or get depressed. I have spent Christmas alone with my wonderful dogs for about 20 years. I have my own traditions. I love watching A Christmas Story over and over. On good years the doggies get toys to open, in lean years they still get and give love. And I usually wash old toys and present them as new. Please be animal friendly and no fur, please. I have some last-minute Steals for Everyone. Simon & Schuster has a FREE E-book. 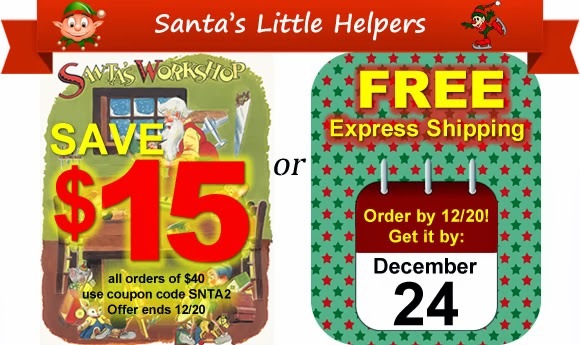 out great gifts under $15, and save an extra 15% when you use code NE846D. And Amazon will come to the rescue! Beginning on December 18, 2013, at 12:00 a.m. PST, select products are available with FREE One-Day Shipping within the continental U.S. when purchased from Amazon.com. Simply add a qualifying product to your Shopping Cart and select One-Day Shipping before completing an order. The shipping discount will be applied at checkout. See product detail page for expiration date of offer. See Terms & Conditions.